With the Minilogue, Korg have certainly hit the sub-£500 synth market running, giving more expensive analogues a serious run for their money - the features, sound and build-to-price ratio are currently unbeatable. Here, we'll show you how to get the most from this brilliant little synth, and how to coax some fresh and vintage sounds from its VCO-driven sound engine. So without further ado, let's get deep into the Minilogue! For more tutorials on the Korg Minilogue, grab Future Music 302, which is on sale now. If you're not sure whether to buy a Minilogue and need a little help to decide, then check out our review. The Minilogue only has a slider and no mod wheel, but it is nonetheless possible to achieve pitchbend and modulation effects simultaneously. Assign pitchbend to the slider, then set the LFO wave to triangle (for natural vibrato) and the LFO target to pitch or filter cutoff. Balance the INT control and Rate dial until you get a natural-sounding vibrato. Now you can use the INT control like a mod wheel, tweaking it directly from the front panel or via MIDI. If you don't need pitchbend, you can assign the slider to any one of 29 other modulation destinations. Route the audio output to the input to give the sound a different character, with compressed lows, extra dirt and more piercing resonance. You'll need to boost the returning/incoming audio with a gain pedal to really hear the effect. EG2 can be used as a modifier, which not only enables some more unorthodox modulation effects but can also get you round the fact the Minilogue keyboard doesn't feature aftertouch by delaying the onset of vibrato or filter modulation after a keypress. To set up delayed vibrato/modulation, activate Poly mode, select a triangle (or ramp or square) wave for the LFO and set the EG Mod slider to modulate the Intensity. Set the LFO INT and Rate dials to half way, then experiment with EG2's Attack dial until the vibrato/modulation onset is delayed after the initial key press. Tweak the filter/EG INT dial for different timbres. You can record the arpeggiator output as a series of sequencer steps! Engage the arp, set step resolution to 1/2, hit record on the sequencer and play a chord. Flip between modes while the sequencer is playing to add variation. 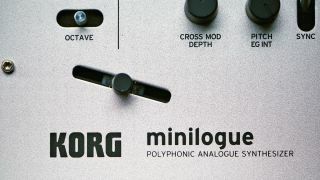 The Minilogue's portamento settings are in the Program Edit page. Press Edit, select Program Edit and hit Mono once. Set Portamento Time to 0 for regular legato or Auto for fingered portamento, and adjust the time. Auto applies legato to overlapping notes only. The bipolar Pitch EG dial only affects Osc 2, generating up/down pitch effects that sound great next to Osc 1, particularly when it's static. When you turn up the Pitch EG dial, EG2's portamento curve is shaped by the EG INT/EG2 ADSR settings. The delay is great for tape and bucket brigade delay-style effects, but it also works as a reverb with shorter time and feedback settings. Use the high-pass filter to dull the delay tails for a darker sound. Oscillator sync is one of the most powerful sonic tools in any analogue synth, and the Minilogue is no slouch in this respect with its Hard Sync option. Turn up both oscillators, flick the Sync switch up (away from you), select Mono mode (or Unison for a bigger mono sound), turn up the Pitch EG, and tweak the sound to taste using EG2's ADSR. You should hear a classic harmonically evolving sync sound. For a sound that slowly passes through the harmonics when a key is pressed, increase the Attack time; and if you want the harmonics to die away quickly, decrease the Decay time. For chorus-type effects, use Cross Mod. For phaser-like effects, increase the filter resonance and assign the LFO to the oscillator shape. One of the biggest aces of the Minilogue is its 'motion' sequencing. If you find your basic patches are lacking a little movement or variation, this is a great tool for getting things moving. It's essentially a more advanced and powerful version of the automation capabilities of Korg's Volca range. Motion sequencing is basically the recording of up to four 'lanes' of dial and switch movements that you can use to spice up sequences. Motion can be smooth or stepped (for more abrupt/angular sound changes) and motion sequence lanes can be muted in/out non- destructively so you can easily revert to your 'pre motion' sequence in the motion edit menu. Also, if you hold Shift while in a motion edit screen, you can view the four motion lane/tracks on the display as an automation-style graph. Finally, one lesser-known but killer feature of the Minilogue is that you can record motion (including the delay, filter pole switches etc) without playing any notes (or alternatively, mute recorded notes once you've recorded the motion). This goes a long way to making up for the fact that there's only one LFO as you can have the sequencer playback four lanes of parameter/motion tweaks while you play along.